The great thing about short period comets is there periodicity, if you miss a comet during one apparition then you can catch it again during the next one. However patience is required, because even with the short period comets one has to wait years between acts. 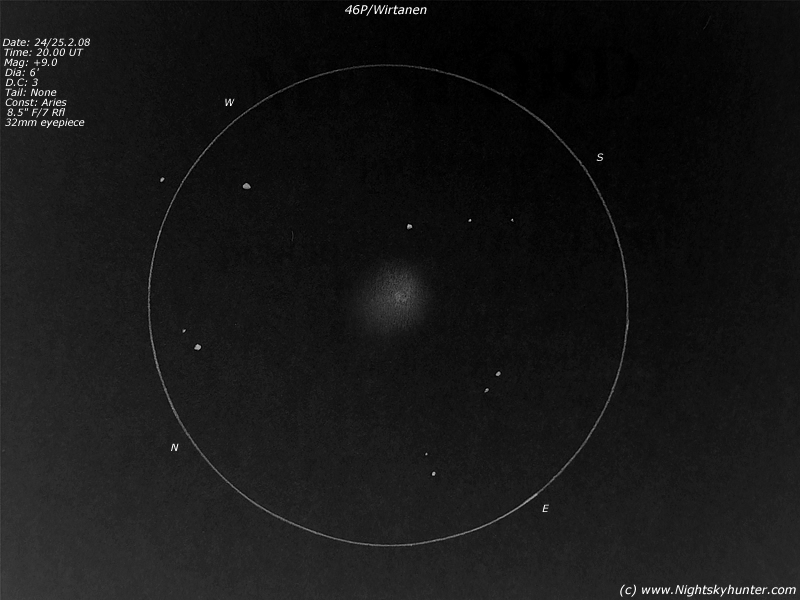 When 46P/Wirtanen was last visible 6.71 years ago I was a young and eager comet observer. The only comets which I had seen during that time were Hale-Bopp, 2P/Encke, C/1999 S4 LINEAR and C/1999 T1 Mc Naught - Hartley. I would have done anything to see another and add it to my very short but growing list. I knew that 46P was visible back then, and where, but I did not see it. Something happened in my private life at that time which caused me a period of great depression. I could not even motivate myself to take the telescope outside and look so I locked myself away into my own world within my room until I managed to recover and return to a more resourceful state of mind. By this time the comet had now retreated further away from the Sun and had faded from the light grasp of my 8" LX10 F/10 S.Cass telescope. I made a decision then and there that I would never let anything or anyone get in the way of my interests ever again. I also made a vow that when this comet returned again I would do my very best to track it down. This was a personal score to settle! On February 24th 2008 the sky was delightful. After a long period of bad weather and hazy skies a passing cold front during the previous night had beat the atmosphere clean with Atlantic showers. This evening I had the 8.5" F/7 dobsonian reflector with 32mm 1.25" eyepiece set up in my front yard during evening twilight. The sky was 100% clear and dark. The waning gibbous Moon was far below the NE horizon and would not rise for several hours. My goal was 46P/ Wirtanen which was now well placed half way up the evening sky in the SW. Before dark I had plotted its RA and DEC onto my sky atlas 2000 showing the comet's positions for the 24th and 25th. It was located within Aries in a very blank region of sky where Aries, Cetus, and the Pleiades meet. I put the comet's position to memory then headed out during twilight to get dark adapted. I made sure my telrad finder was aligned accurately and checked focus on the naked eye star Almach in Andromeda. I guided the scope upwards to Wirtanen's location and began sweeping without success, twilight was still evident so I decided to wait until the sky darkened further. Meanwhile I began searching for new comets low in the western twilight through Pegasus but I was getting very angry and frustrated quickly. The head lights of passing cars and the security lights belonging to the neighbours had destroyed my prime search area. The telescopic FOV was a bright white glow and even in the areas away from the lights I was getting a bright ghost image in every field. I was furious with anger and after 15 min's of hunting I had to stop. I was not in a good mood at all. I then calmed down and concentrated my efforts on 46P. I spent a long long time slowly sweeping for the comet using vertical and horizontal movements and still it was nowhere to be seen. By now a sharp frost was forming and despite wearing gloves my hands were freezing from touching the scope for such long periods of time. My fingers were red in colour and painful. I was going to give up then I gave myself a mental slap. I told myself that I was not going to leave the telescope until I found this comet. 20 min's later at 20.00 UT the ghostly glow of the comet entered the field of my moving telescope. I actually said out loud, ''I got Ya!!!''. Wirtanen was no easy catch. The coma had a nice green hue and was of a fairly large elliptical shape with very diffuse edges. Difficult to tell where the coma ended and the sky began. The coma got slightly brighter toward centre and had a faint white-coloured soft stellar condensation. The comet was best seen with averted vision and no tail was detected. I suspect the coma may be larger than this when seen from a darker site. I made the above sketch at the time. I watched the comet contently for 30 min's then it lowered into the murk and was gone. I was delighted by the catch, in fact, it made my night!. There are now no tense feelings between Wirtanen and I. The comet can relax and sail through the solar system at peace and I can tick it off my list and concentrate on hunting down other cometary prey!. Mag: +9.0 Dia: 6' D.C: 3 Elongation from Sun: 69.9 degrees. This is my 43rd comet catch.